There was a line of screamers making their way towards the concrete house. When Mhumhi passed between them they turned and held out their hands, their eyes on the small body he held in his jaws. Mhumhi growled at them. A little crowd of them had gathered around the sides of the valley, making a din of hooting and screeching. Mhumhi shoved and shouldered his way through, keeping his lip raised and his teeth clenched in Mini’s fur. He smelled the blood before he reached the center. Two female screamers were crouched on either side of the fire pit, slapping their fists and shrieking angrily. One aimed a fist at the other and struck a glancing blow, sending her sprawling. A third screamer bulled forward, and the female turned and grappled with him. Mhumhi laid Mini’s body down and gave a loud snarl. At once the screamers around him backed away, giving fearful hoots and covering their faces. The three in the center froze, the sprawling one flattening further. Without the press of bodies, Mhumhi saw what they had been fighting over- what he had been afraid of. Beside the fire pit lay a hulker body. Sekayi. His eyes were closed, and the dirt around him was crumbling red with blood. There was blood on the mouth of the standing female screamer. Without thinking Mhumhi flung himself at her, springing upwards, and caught her throat in his teeth. She made a shrill, thin sound and her blood poured into his mouth. She fell forward, on top of him. It had gotten very quiet. The big male screamer by the fire pit was crouched, head tilted, staring at Mhumhi where he lay pinned. The others were wavering, and Mhumhi saw the female that had been knocked over slowly getting to her feet. He shoved and struggled and managed to drag himself out from underneath the dead female, chattering angrily at the others so that they flinched back. A smear of blood from her throat stained his back. Mhumhi’s ears turned back, but then he saw a screamer picking up Mini’s body, and leapt forward. The screamer dropped Mini with a scream, crouching and covering itself with its arms. Mhumhi snatched up her body and backed away, glowering, feeling a thrumming hatred like he’d never felt before. He backed up into something soft and whirled around, but it was Sekayi. He had raised his head up slightly. One of his eyes was bloodied and swollen shut, the ruined side of his face caked with blood and filth. Mhumhi put Mini down again. Sekayi twitched, struggling to move his arm forward, and Mhumhi nudged her closer. “Ah,” said Sekayi, when his fingers brushed her cold fur. “Ah…” Tears began to run through the dirt on his filthy cheeks. “I’m sorry,” said Mhumhi, his tail tucking. Sekayi closed his remaining black eye. Sekayi didn’t open his eye. Mhumhi felt like a dead weight had settled in his chest. A tremor seemed to pass through Sekayi, and he took a ragged breath. He dragged his other arm- the injured one- forward, fresh blood leaking through his bandages. In his hand was a crumpled bit of metal. Mhumhi sniffed it- it smelled like Mini. He opened his eye and pointed slowly to the mess on the side of his face. Through the blood and pulpy flesh Mhumhi saw a new, circular bite mark. “Kissed, then bit,” Sekayi rasped. Mhumhi began to growl, his tail rising. The bottom of Mhumhi’s stomach seemed to drop out. The female screamer he had killed lay stretched out on the ground behind him. 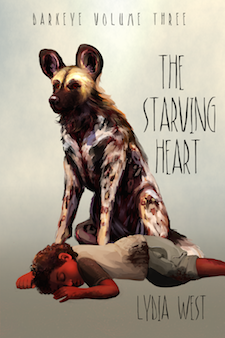 “No- no one is going to eat you,” said Mhumhi, his voice trembling. “I don’t plan to get up,” he said. This made Sekayi flinch. His fingers curled into her fur. Sekayi stayed quiet for a moment, his single dark eye flicking towards the ground. He smiled with half his mouth. “I’ve lost a lot of blood,” Sekayi warned him. He seemed to be struggling, and he took his hand off of Mini to push himself up. Mhumhi tucked his tail and stepped backwards. Sekayi’s bare chest was peppered with bite marks. One pale white rib showed through the blood. Mhumhi, tail still tucked, glowered at him for a moment. Sekayi gently picked her up, cradling her, so that her nose fell into the crook of his arm. Mhumhi let him put his free hand on his back, and they walked slowly together, Sekayi stumbling and breathing hard. He did not look at the dead screamer on the ground. Mhumhi didn’t either, keeping his gaze fixed on the live ones at the top of the trash valley. They made their way forward, painstakingly slowly, parting through the screamers, which gazed at them with their empty dark eyes. Some still smiled and reached out- some with blood around their mouths. Mhumhi saw them, as if for the first time: their encoded gentleness had not taken away everything… not their will to survive. Even they got hungry enough. The distant yap-howl of a coyote made his ears twitch. Sekayi’s hand clenched at the loose skin on his back as he strained to move more quickly. He was panting hard, and blood was pooling from his chest down between his skin and the fabric at his waist. The scent of it filled Mhumhi’s nostrils, and made his heart hammer. He wouldn’t be the only one to smell it. He pushed Sekayi on, half-encouraging, half-growling. They seemed to crawl across the dump, and everywhere, screamers were watching them. “Where there’s someone else to protect you,” Mhumhi growled. Sekayi didn’t ask any more questions, but even in the haze of pain he must have been in, the side of his mouth quirked upwards a little. The sun was low in the sky by the time they found the tall stacks of tires, and it shone in Mhumhi’s eyes so that he had to squint and duck his head as he led Sekayi forward. The bouda had not spoken at all, dragging one foot in front of the other, breathing slowly, his body coated in a sheen of moisture. Mini’s legs swung from underneath his arm. Bii burst out of a nearby tire with a loud yap. “Shut up,” Mhumhi said again. Sekayi said nothing. Mhumhi was not even sure he even saw Bii. Sekayi sat down so quickly he gave out a loud cry of pain and fell on his side, his eye squeezed shut. Mhumhi whined and licked his forehead, which felt terribly cool. Sekayi seemed not to feel it. He pushed his own forehead against the bouda’s. The voice was Hlolwa’s, and Mhumhi turned around to see her sitting out in the little entrance, a thin, imposing silhouette. Her eyes were pale and cold. “Get rid of him,” Hlolwa said. “By… by…” He looked down on the ground. Hlolwa’s eyes flicked to the bite marks visible on Sekayi’s chest. “They got them back when they were hungry enough,” Mhumhi said coldly. Hlolwa looked back at him and gave a tight smile. Mhumhi looked back at Sekayi, at his chest, which was barely moving, and felt helpless. Mhumhi spun around angrily, but stopped when he met her gaze: it was cold, as if daring him to be so callous. The fight went out of him, and his head drooped forward. Mhumhi glared after her as she disappeared between the tires, then looked back at Sekayi. He seemed to be sleeping deeply, which was some comfort. Mhumhi licked his cheek, then slowly began the painstaking job of cleaning his crusted wounds. He hadn’t gotten very far when he heard a stream of furious painted dog chatter and the sound of a scuffle. Mhumhi leapt up and ran outside just in time to see Bii, hobble by, ears flattened and panting, with Hlolwa snarling at his heels. Mhumhi pushed quickly between them. There was something truly evil in Hlolwa’s gaze as she looked down at the little fox through Mhumhi’s legs. “He was in my den,” she said. “Checking on-” started Bii, and then gave a yip when Mhumhi took him by the scruff and shook him a little. Hlolwa’s eyes thinned, her nostrils twitching, but she raised her head and stalked back towards the darkness of the den. “That was stupid, Bii,” Mhumhi told him. Bii’s bat-ears sprang back up. Mhumhi had to admit, however sourly, that he was right. He spend most of the rest of the daylight stalking around in the tires, his nose filling with the smell of hot rubber. Bii arranged himself at the top of one of the stacks, his large ears pointed back the way they had come. Darkness was falling when Mhumhi went back to check on Sekayi, but a noise made him stop before he entered the little shelter of tires. The voice was Hlolwa’s, and much to Mhumhi’s amazement, Sekayi was the one who answered her. “No,” said Hlolwa. “I suppose there was no way she could serve you.” She sounded, to Mhumhi’s ears, almost hesitant about what she was saying. Sekayi laughed a little at this. “I never thanked you,” he said. Mhumhi heard the smile in Sekayi’s voice. This time the silence was very delicate. Mhumhi felt tense, and wondered whether or not he should leap in. But then Hlolwa spoke again. There was a stiff pause. Hlolwa did not respond to him. Mhumhi heard her soft footsteps approaching and drew back into the shadows, flattening his ears. Hlolwa stopped and turned her head towards him, the pale gleam of her eyes still evident in the faint light. She did not say anything, though, and simply passed him by. When Mhumhi went back into the little shelter, Sekayi was on his feet, supporting himself against the tires with one hand. He took a shaky step forwards. Mhumhi crossed in front of him. “Sekayi,” said Mhumhi, in a warning way. “I know,” said Sekayi. “I’m sorry.” He tried to take a step forward, but Mhumhi stopped him with a growl. “She wants to save her puppies,” said Sekayi. They walked slowly together in the darkness. The scent of tires faded from Mhumhi’s nose, but perhaps it was because the scent of blood and sweat coming off of Sekayi was so strong. His breathing was ragged, and he was barely moving. “Do you want to stop?” Mhumhi murmured. Sekayi did not respond. Clouds had come across the moon, and Mhumhi’s eyes could barely make him out. His ears flicked- there was something moving nearby, in the darkness. Something clattered in the garbage. Mhumhi gave a soft growl, but stayed close to Sekayi, who was dragging his foot forward, struggling to take another step. Something wet hit Mhumhi’s ear, and he flinched. But the drop was cold, not warm blood or sweat like he had feared, and then there came another. The soft pat, pat sounds on the ground and the light drops falling on his back made him realize that it was raining. He had not felt rain in a long time. He tilted his head back, eyes wide, and drops slithered down the insides of his rounded ears, making whispering sounds. Rain dripped down on either side of his lips and touched his tongue. It was sweet. There was a thump beside him. He realized that Sekayi had fallen over in the darkness. “Sekayi!” he called, but softly, and nosed the man’s cool side. The rain was still falling, but it already seemed lessened, making soft pit, pit noises where it hit plastic or metal. A cool wind brushed Mhumhi’s damp fur. Moonlight cleared through the clouds. Mhumhi saw the yellow gleam of Sekayi’s single hyena eye. It was open and staring, unblinking, and filled with rain. There you go killing people off again… will there never be a stable pack?